Redman Homes in Lindsay, California consistently builds high-quality, high-value manufactured homes. Picture a large manufacturing plant with approximately 20 to 25 workstations on an assembly line. To ensure that the craftsmen working the line have access to what they need to get the job done effectively and efficiently, tools, jigs, tables and material-handling equipment are all within easy reach. In addition to the assembly line, there are multiple worktables in the plant where smaller components are constructed. These worktables deliver items to the assembly line with the aid of overhead crane systems. Each station has the tools and equipment needed to complete the work within the station … again delivering the effectiveness and efficiency that’s become a Redman Homes hallmark. Rigorous quality audits of the modules are conducted throughout these steps. In-house inspectors and third-party federal or state inspectors conduct the audits to confirm that each home exceeds the appropriate building code. How rigorous? Each Redman manufactured home must pass 100 inspection steps conducted by Quality Control Specialists! We build high-quality, high-value homes that exceed our customers' needs and expectations. 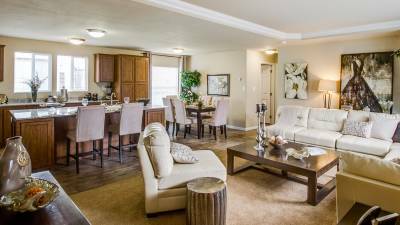 Redman Homes is known for building innovative, high-quality, high-value manufactured homes throughout California.